Pragya’s duppata gets struck to Abhi’s watch. Abhi blames her for following and later for stealing watch, she says i wanted to remove dupatta. Abhi is about to say sorry, pragya stops him, she is about to fall while walking behind looking at him. He holds her. and she sits on his knee and he is on the ground sitting on his other knee she gets up and he shouts ganapathi bappa. Purab comes and teases Abhi about alag hi event going. Purab asks about the girl and Abhi says she is not his type. Purab teases Abhi. Saira and pragya talk about perfomance. Pragya says she is scared of performing in front of everyone. Pragya says she wants to but her feet shivers. Saira jokes don’t worry it will look like a Dance. Saira says Abhi will be doing the best perfomance. Abhi agrees. 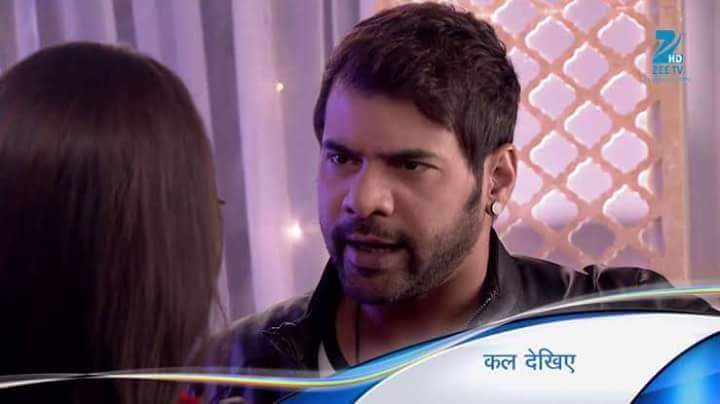 Abhi heard and thinks how can pragya have stage fear being his fan. Alia comes and asks what happened?. Saira first doesn’t tell and later tells about pragya’s stage fear. Alia mocks her middle class and how they get scared and they can never be equal to them. Everybody support Alia and Pragyafeels bad. Alia says Pragya must have danced in previous years Ganapathi event in chawls ( I think so ). Aalia leave and Saira asks pragyato not feel bad. Abhi brings Pragya on stage. She is getting scared. Abhi asks you are my fan and you are getting scared. A bhiasks her to be like him. She says she doesnt want to. He holds her face and asks if she trust him?. She says more than herself. He says give ur hand in my hand i will not let anything to happent to u. Pragya gives hand. Eyelock. Abhi is bringing Pragya to stage and Alia stops everyone from taking pics. She threatens photographers. Purab comes and mocks her she cannot seperate AbhiGya. Purab suggest her to change using this as a opportunity. Abhi announces Pragya will perform with him after thanking them. He says Pragya will sing. Abhi asks her to forget she is on stage infront of people and think she is with him in his room and ask her to think of him and sing to impress him. She starts singing. He is impressed and he sings along. Everybody cheer for them.Pragya starts to sing Tum hi ho song ..Abhi is just mesmerized by her voice and he joins saying Zindagi ab tum hi ho (it was lovely). Everybody clap.Pragya closes her eyes and imagines the white outfits dance.Abhigya danes on Tere sang yaara ..He leaves and pragya dances alone for the song Agar tum saath ho… Abhi enters while Pragya is performing and everyone run to him.Allah waariyaan plays (Must watch it so lovely). AbhiGya infront of each other. Abhi is in his previous outfit.They both hug each other Allah waariyaan continues .Back to reality. Everybody clap for Pragya. than Abhi. Saira says okay, I will get it from her. Aaliya stops Saira and takes her forcibly from there. Purab appreciates Pragya’s singing skills on stage, and says you sung great. Pragya says she got strength from Abhi, as he introduces her as his biggest fan. Purab says even God wanted this, and that’s why you came on stage. Pragya says but I am just his fan for him, and says I don’t want to dream anything. Abhi says I have heard everything….and come to them. He says what you were talking about? Purab says I was telling her about event. Pragya says I don’t want to see any bad dream. Abhi says what you was saying, asking help from Purab to help you become a singer. Purab says di….Abhi says di. Purab says she…he says her sister will feel bad. Abhi asks did you see in her eyes? Purab says what will happen if I see? He asks if he is jealous…and says you told that she is not your type. Pragya says did you say it? Abhi says I told cute also. He says she is my true fan and knows everything about me. He says I will help her whenever needed. Purab says you have to be with her everytime. Dadi and Dasi greet Sarla and Beeji and leave in their car. Sarla says Abhi might have felt bad as we haven’t come there. Beeji asks her to think about Pragya’s love. Sarla says I am thinking about her betterment and says I can’t risked her life for her happiness. She tells that she is scared of Aaliya and her threat. Beeji asks her not to worry. Mr. Sethi goes on stage and says Abhishek Mehra will launch the album. Aaliya thinks it will be a joke and fun. Abhi addresses to the media and says he is rocking and will always rock, he is not affected by the accident. Reporter asks when we will hear your concert date. Abhi says I am going to do a rocking concert soon for my fans. Aaliya wonders where is Pragya? Music CD is played and it turns out to be a wrong song. Audience get crazy. 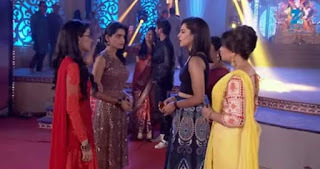 Saira asks Pragya what did she play? Pragya gets stunned and shocked. Abhi laughs and says it is a prank played by him. He says his album will be launched tomorrow online. Aaliya thinks she will watch the show made by her. when you are pulled down. Pragya got enough disrespected today. Bhai only shower her her place today. She wont come before him after today if she is a little ashamed of herself. Abhi comes to where Pragya is. You make mistake and cry too. I will scold you if you are wrong. She replies that she dint make any mistake. He refuses to believe it. Every thief says so. I dint say that to you but in general. Please don’t cry. I don’t like it. She asks him why he makes her cry then. He explains that he can scold her if she makes a mistake which she certainly did her. She says I only played the CD which I got. I don’t have any mood to do things wrong or play wrong songs. He wonders where he got stuck. He tells her he dint know. It was my mistake. I am mad to scold you. I am sorry. Please wipe your tears. She complies. He jokes that she should be happy. I said sorry toy ou twice. She retorts that the one who makes mistake will apologize. You said I am not your fan no. 1. I dint even get that poster in your office. I dint come to talk to you. Leave it. You do things as you like. Some girls come to take his autograph so they go quiet. Once the girls leave, Pragya starts scolding him again. You are Khadus. I make you Khadus No. 1. I wont hear your song, neither in the car nor neighbourhood. I will close my ears instead. She returns him his handkerchief. He thinks my event got spoiled. She is still scolding me and I am evenly apologizing. She leaves finally. He mistakenly plays the CD again. He walks away feeling embarrassed as people look at him. Pragya walks up to Abhi’s poster and scolds it. You don’t have to listen to anyone. You only know how to scold people. You are a great rock star after all! You said you wont talk to me? I will not talk to you. It will hurt your ego. Purab comes to her. Did you have a word with him? She disagrees. I don’t know anyone by that name. He is taken aback. She tells him not to take his name before her. He is a rock star. She tells him what Abhi said to her. Purab jokes and ends up sayin sorry to her. Pragya says you both say anything you want to and then say sorry. He apologizes again. You are acting like Abhi too. You aren’t even listening to me. Good thing is he dint fire you. He only scolded you. She tells him not to take his side. He disagrees. It was all Aaliya’s plan. I warned you she will come here and do something to make you look bad in Abhi’s eyes. He isn’t at fault. He only reacted to what he saw. She agrees not to scold Abhi. But I wont spare that Aaliya. He asks her what proof she has. What will you say to Abhi? It will only make things better for Aaliya. Pragya nods. Everything was going so well. He was speaking to me so nicely and now this. I cannot take it. He says I understand but forget about this for now. It will be fine. They leave together.